The charming article about the “higher significance of things” inspired what - for one brief moment - I thought was an original idea. Why not make a Mary garden, a flower garden dedicated to Our Lady planted only in flowers whose names refer to her in some way? What a lovely way to honor the Blessed Virgin, who is always so ready to assist us in our daily needs. It didn’t take long to find that the Mary garden is an old idea, a very old one indeed, which dates back to the Middle Ages when many flowers referred to the Virgin’s life and virtues. 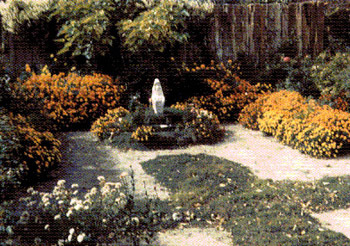 Every monastery and convent had a special Mary garden to provide flowers to adorn the altar. It was because of the abundance of flowers in May that it became Mary’s month, and the people delighted in decorating her statue and altar with flowers. The little people found their Mary gardens in the field and forests, where so many flowers spoke to them of some aspect of Our Lady and her Divine Son. It is said that then, in those happy days of Faith, the flowers honored Mary, the choicest Flower of All, the Mystical Rose; everyone knew that it was she of whom Solomon sang: I am a rose of Sharon, a lily of the valleys. The beauty and peculiar characteristics of various flowers reminded the medieval man of Our Lady, and so they received their names. 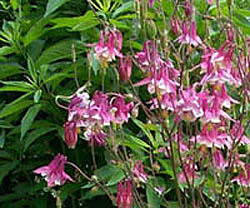 The columbine was Our Lady’s Slippers because they seemed like fanciful lady’s slippers. They were said to spring from the earth where Our Lady’s foot stepped on her way to visit her cousin Elizabeth. Another well-known flower, the Sweet William, was Our Lady’s Cushion, because the cluster of delicate flowerets seemed like a fairy-like cushion for their Queen. The Fuchsia with its gently drooping flowers was Our Lady’s Eardrops. It was easy for the little people to image the Christ Child hanging those flower jewels of ruby and amethyst color on His mother’s ears. 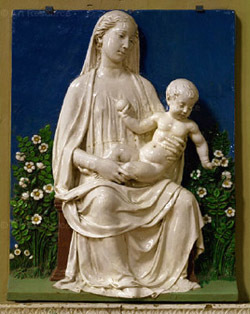 The sweet-scented honeysuckle flowers with their delicate long white stems were Our Lady’s Fingers. The rich blanket of blue Morning Glories seemed like Our Lady’s Mantle, and so they named it. The forget-me-not, a clear blue flower with a golden center, was the Eyes of Mary. The flowers also spoke of the virtue and qualities of Our Lady. 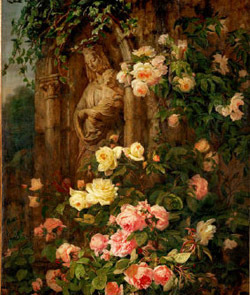 Since the times of early Christianity the rose and lily were identified with Mary. It was only natural that the rose, the most perfect of flowers, should symbolize the Virgin Mary, the most perfect of women. The white rose represented her exquisite purity, the red rose, her profound sorrow, and the yellow rose, her triumphant glory. Other flora names sprung from legends regarding the life of the Holy Family. Lavender was called Mary’s Drying Plant because, so the story goes, Our Lady hung the Divine Infant’s clothing to dry on a gray lavender bush. From the blankets of the Son of God, the plant took its sweet scent and lavender color.Similar stories are told of rosemary – St. Mary’s Tree – and other sweet-scented shrubs. Juniper, the Madonna’s Bush was rewarded for its generosity in giving shelter to the Holy Family on its flight to Egypt. And marigolds (Mary’s Gold) spilled out of Mary’s purse when the Holy Family was accosted by robbers during the flight to Egypt. Many names were born from tender reflections on the Passion of Christ. When the Virgin Mary’s tears fell at the foot of the Cross, the medievals told their children, they turned into the tiny fragrant blossoms of the lily of the valley, that early spring plant called Our Lady’s Tears. 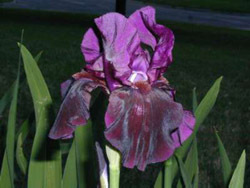 The purple flag iris we know so well was called Mary’s Sword of Sorrow. The pointed leaves reminded the medieval man of swords, and then his thought turned naturally to the swords that pierced the Heart of their beloved Mother. The flower legends grew from the devotion and love of the people, who thought of Mary when they observed the beauties, oddities and distinctive features of the flower world. The names spread and were repeated with small variations throughout Catholic Europe. Today, making a Mary garden is a means to re-find those beautiful names, to reflect again on the “higher significance of things,” to make the flower garden a place of prayer and simple meditation on the life and virtues of Our Lady. It is not difficult to make your own Mary garden. Quite simply, it is a grouping of flowers, ivy or herbs dedicated to Our Lady. Strictly speaking, all the plants in it should be associated with her in some way. This is not so difficult, since, as noted above, many flower names found inspiration from her life. An indoor Mary garden planting in a decorative pot makes a wonderful gift for a friend or elderly person devoted to Our Lady. 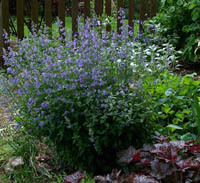 The Mary garden is also a wonderful class project for the home-schooling family. All the family members can learn the charming old religious names of flowers and herbs and begin again to see the things of Heaven in the world around us. 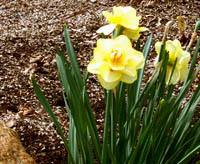 A one-stop web resource for the Mary garden is titled Mary Garden, founded by John S. Stokes, Jr. 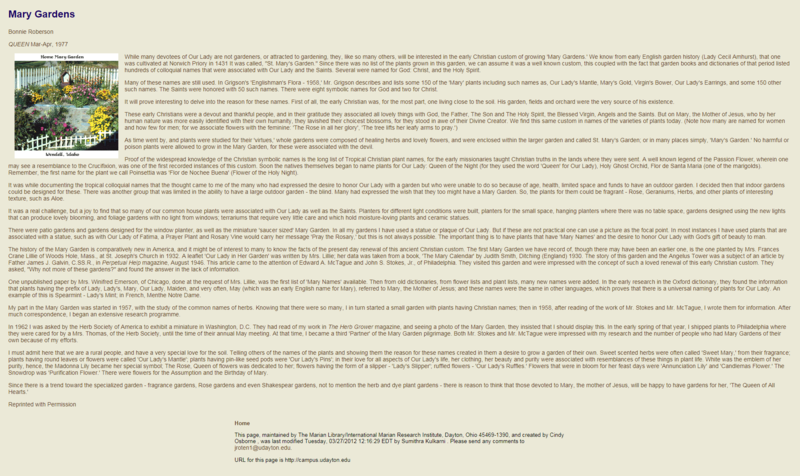 It offers an extensive archive of articles with information about every aspect of a Mary garden you can imagine. It was, in fact, the primary resource for this article. On his website, you will find the legends and histories of hundreds of Mary Flowers in England, France, Germany, Ireland, Latin America and Spain. He records the history of the Mary gardens in the United States, beginning with the first Mary garden at Woods Hole on Cape Cod founded in 1932. 1. Vincenzina Krymow, Mary’s Flowers: Gardens, Legends & Meditations, Cincinnati: St. Anthony’s Messenger Press, 1999, p. 28. Naivety or a Higher Understanding of Things?